Normally, I wouldn’t make two consecutive posts of records by the same artist, but today, August 4, marks the great Louis Armstrong’s 114th birthday, so I’m making an exception. To celebrate the momentous occasion, I present to you Armstrong’s theme song, and one of his most popular early records. Okeh 41504, recorded April 20 and 28, 1931 in Chicago, Illinois, features Louis Armstrong on trumpet and vocals, backed by Zilner Randolph on second trumpet, Preston Jackson on trombone, Lester Boone (on clarinet and alto sax), Albert Washington (on clarinet and tenor sax), and George James in the reed section, Charlie Alexander on piano, Mike McKendrick on banjo and guitar, John Lindsay on bass, and Tubby Hall on drums. 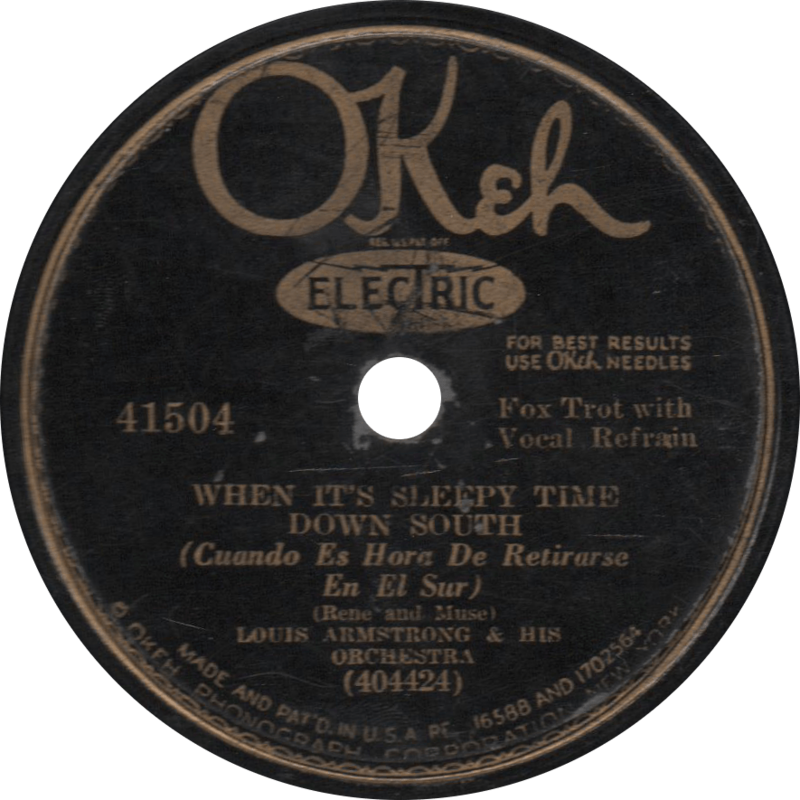 First up is “When It’s Sleepy Time Down South”, recorded April 20, a composition by brothers Otis and Leon René and Clarence Muse which would become his theme song. Louis starts by striking up a conversation with pianist Charlie Alexander (who actually hailed from Ohio) about their home back in New Orleans before segueing into the song. When It’s Sleepy Time Down South, recorded April 20, 1931 by Louis Armstrong and his Orchestra. 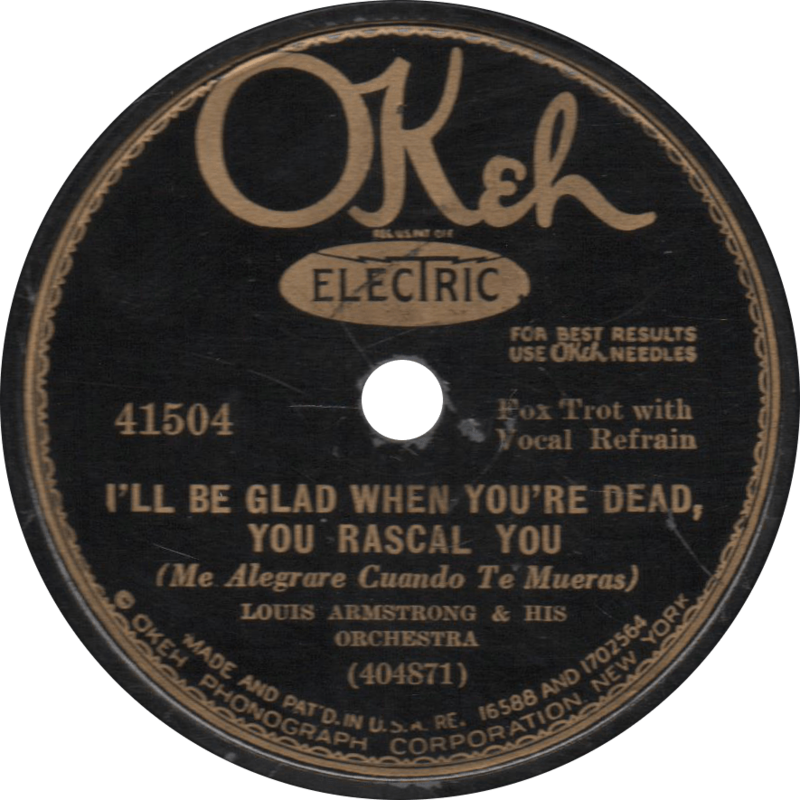 On the flip, recorded April 28, Louis and the band play “I’ll Be Glad When Your Dead, You Rascal You”, written by “Lovin’ Sam” Theard (though Cow Cow Davenport claimed to have written it), one of his most popular songs of the day, which he would replay twice over the following year for Paramount Pictures and Fleischer Studios. This entry was posted in Records and tagged 1930s, 1931, Albert Washington, Charlie Alexander, Chicago, Clarence Muse, Cow Cow Davenport, George James, Jazz, John Lindsay, Lester Boone, Louis Armstrong, Lovin' Sam Theard, Mike McKendrick, Okeh, Otis and Leon René, Preston Jackson, Tubby Hall, Zilner Randolph by R. Connor Montgomery. Bookmark the permalink.